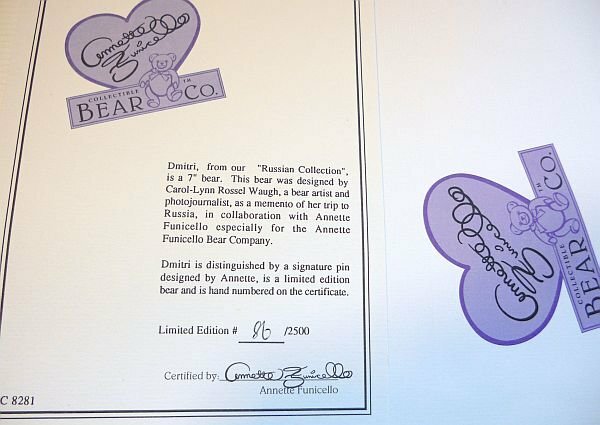 Dmitri wears his signature purple pin in his left ear and is numbered 86 of a limited edition of 2500. Dmitri is the brother of another Russian Bear named Artyom (see listing). 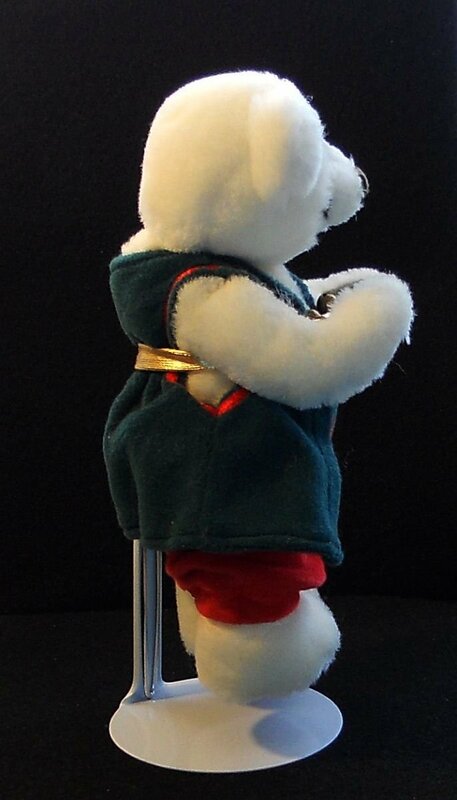 He is made of short white plush with shaved face, a hump on his back that is typical of Russian styling. He is a fully jointed bear. Dmitri has black plastic eyes and dark brown hand-stitched large nose, mouth and eye-brows. His paw and foot pads are a putty colored felt. Dmitri wears a dark-green velveteen sleeve-less coat with red braid trim around the arms. The coat opens in the front and is held with 2 tiny gold "jingle bells" in frog-like closure. He has a gold belt around the waist. He is also wearing red velveteen pull-on pants with elastic and red trim. He comes with his own white metal stand. 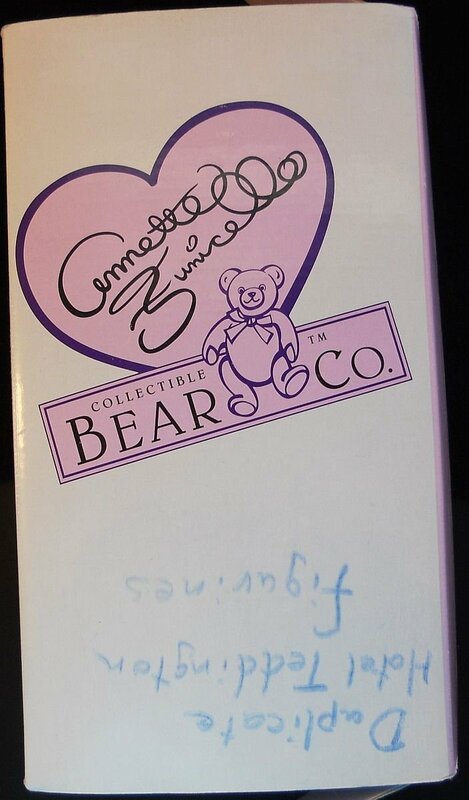 Dmitri is a 7 inch bear from the Annette Funicello's "Russian Collection". 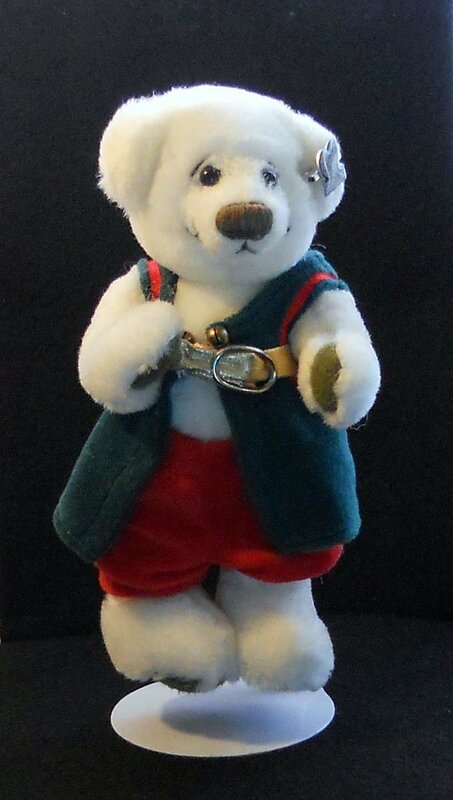 This bear was designed by Carol-Lynn Rossel Waugh, a bear artist and photo journalist, as a memento of her trip to Russia. 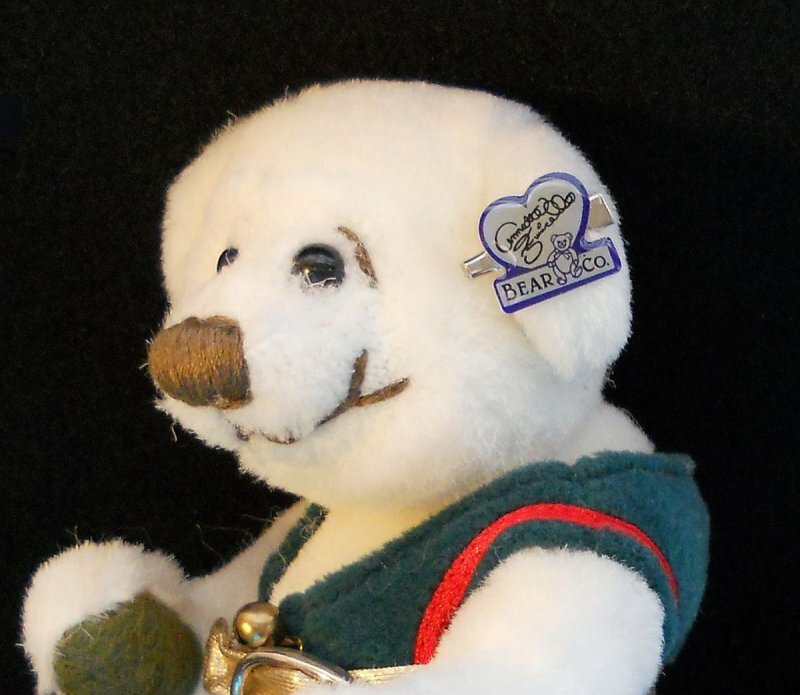 This little bear was purchased January 1994 from QVC. His tag and Certificate are in pristine condition as they were stored in photo album and will be sent with him. This bear was on display for a time and has some dust. Otherwise, he is in excellent shape. *Though some of these bears are high-end adult collectible, not all are and they may contain small parts and present choking hazard for small children.